Your Source for Fixtures, Displays and Accessories! KC Store Fixtures is a leader in reliable customer service, in stock inventory, and the lowest prices in the store fixture industry. We commit to your satisfaction and strive for not just your first purchase but a continued relationship for all your purchases of store fixtures. As a premier provider of store display fixtures and retail fixtures, we know how important it is to have quality products made of the best materials available. That is why we offer a 30-day guarantee on all the products we sell. So shop with the confidence that if you are not satisfied we will take it back and give you full credit. With our "Best Price Guarantee", you won't find a better value anywhere else. Let KC Store Fixtures be your one stop source for all retail display fixtures & supplies. Shop online or call one of our friendly and knowledgeable sales associates to assist you. They are here to help answer questions or offer suggestions in collaboration with you to create the best retail solution. "If you can't find what you need, let us know, we can help!" We also offer same day shipping and the best prices on all your store display fixtures & store supplies. With 25 years in the retail fixture industry, we have worked with a myriad of industries throughout the United States and around the globe. From automotive, food and beverage, apparel and sporting goods to gift shops, museums, schools, pharmacies and theme parks. 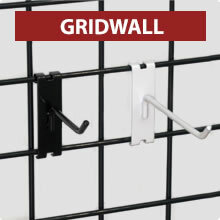 Gridwall fixtures provide durability and flexibility to display a wide variety of products. 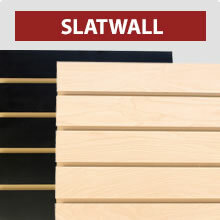 Slatwall Panels & accessories provide flexible merchandising while maximizing wall space. 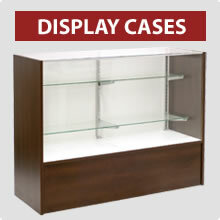 Retail Display Cases: Offering Retail Cases, wall and upright cases and countertop cases just to mention a few. 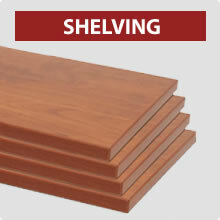 Shelving: Whether you need glass shelving, wood melamine, plastic bullnose, grid wall or slatwall shelves we have them in stock and ready to ship. 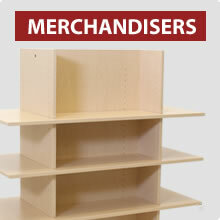 Merchandisers are the backbone of store display fixtures. Choose from floor standing, countertop or wall merchandisers. 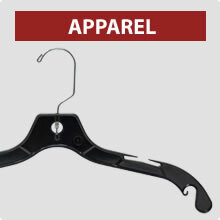 Apparel Displays: From Mannequins and Forms to Clothes hangers and clothes racks, we stock a large selection of apparel related items. 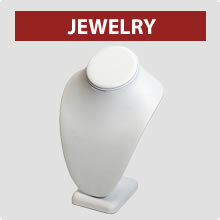 Jewelry Displays: Highlight necklaces, earrings, bracelets, and more with a variety of displays. 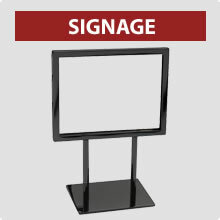 Signage: Advertise promotional messages and pricing with the help of countertop or floor standing sign holders. 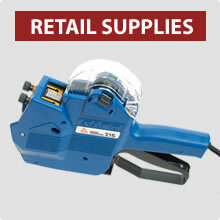 Retail Store Supplies: We carry Steamers and a selection of pricing and tagging gun supplies. 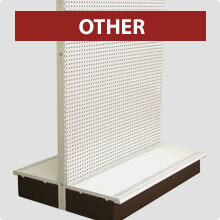 Other essentials: Pegboard gondola and wall standards for versatile merchandising. We also offer firearm displays and accessories.